The Illustrated London News published this very sobering image showing the general reader in London in 1933. 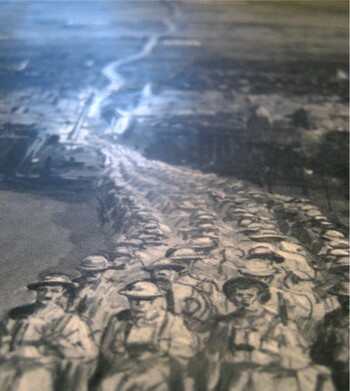 It is entitled “In Memory of the 1,104,890 British Dead of the Great War”, and was drawn by D. Macpherson. It very graphically represents all of the war dead of the British Empire of 1914-1918, depicted as a line of men, four across, extending from London to Durhham. 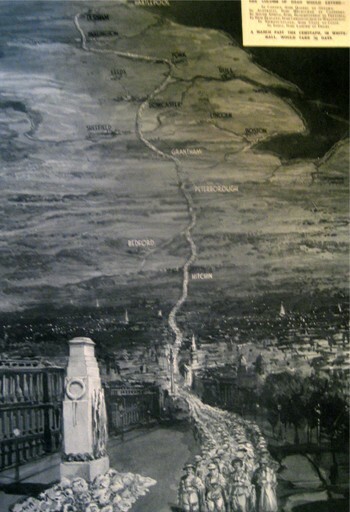 The column passes from London through Hitchin, through Bedford and Peterborough and Grantham, past Sheffield and Leeds and York, and then on to Durham. An extraordinary column of the war dead: 900,000 of the dead were not soldiers at the beginning of the war, but they sure died that way, and this map shows them all in a line, marching from a point 269 miles distant. The number is mind-numbing, incomprehensibly large. A picture is worth a 1000 words, or in this case, more than a million human lives. But imagine how long the lines would be if they included all of those soldiers who were wounded but survived. Or if it included those of all nations.